Here is a picture of 1 of 7 Senses roller blinds, fitted for a customer in Bovey Tracey. Senses roller blinds come in an enclosed cassette, with an aluminium fascia in white, black, bronze, brown, cream or silver. Alternatively, the fascia can be covered in either a matching, or contrasting fabric. The main feature of the Senses roller blind is the slow rise spring system. This system, which is fully adjustable for speed and tension, allows you to pull down and lock the blind in position and then release it and it slowly rises on it’s own. Also the Senses system is the only roller blind system to fully address concerns over safety. Young children can be in danger of strangulation from pull cords, chains and bead cords. This chain & cord free system tackles this worrying problem. I have today had my new sign written vehicle delivered to me. I am very happy with the outcome, it’s hard to miss me now! 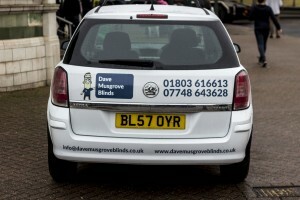 I have had both the sides and the back of the vehicle sign written to give maximum visibility. This has been on my list of to do’s for a while and now my van matches my brand. 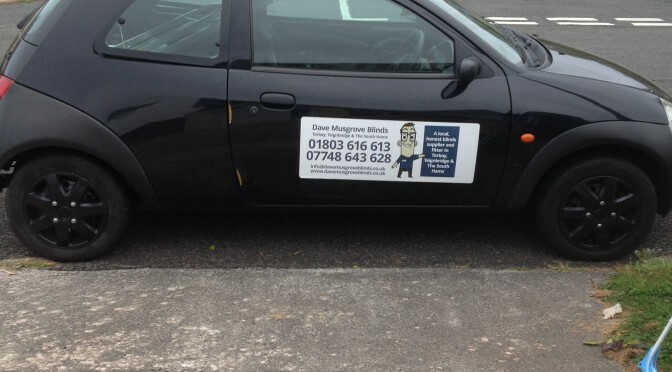 Keep an eye out for me around Torquay, Paignton, Brixham and the surrounding areas. If you would like a quote regarding any of my blinds, please fill in the form below. Wooden Venetian blinds have grown in popularity over the last 10 years. Venetian blinds were first patented in this country in 1769 and 1841 in the USA. Back then all were made of wood, but over the years, with the advent of aluminium, slats were made of this new alloy, enabling them to be thinner & lighter. In recent times there has been a move back to the classic design of the Wooden Venetian blind. My Wooden Venetian blinds come in a wide range of wood colours as well as designer colourways. I also supply & fit Faux Wooden Venetian blinds, made of uPVC. These look almost identical to their wooden counterparts, but have the advantage of being more suitable for kitchens & bathrooms. Wooden Venetian blinds come in 3 slat widths, 25mm, 35mm & 50mm. The attached photo is of a white 50mm Wooden Venetian blind, recently fitted in Teignmouth. Roman Blinds offer an alternative to either curtains or traditional blinds. They can be fitted outside a window, with a blind inside. Alternatively they can be fitted inside the window recess with curtains outside, or they can be the only form of shading at a window. All of my Roman Blinds are supplied and fitted on the latest hardware, with a simple side chain operation, doing away with the previous method (a method still used on cheaper Roman Blinds) of clumsy cords and cleats. My Roman Blinds come with all current child safety features as standard. The attached photo is of a beautiful Roman Blind fitted in a re furbished bathroom in Newton Abbot. For those worried about child safety regarding cords and chains on blinds, here is a photo of the approved fitting for our Vertical Blinds. 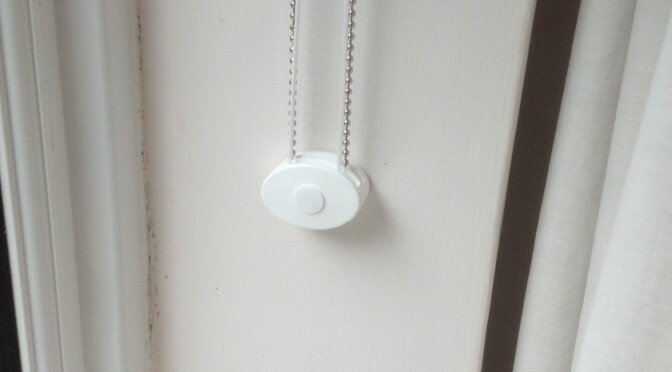 Both the cord and chain are secured within the device and fitted at a minimum height of 1.5m from floor level, as required by the current legislation. This device was one of many fitted at a property in Kingskerswell, Newton Abbot, South Devon. If you’re worried about existing blinds you had fitted prior to the new laws, whether I fitted them or not, I will be only too happy to supply and fit child safety devices for a small charge. If you would like a quote or any advice regarding blinds, please feel free to visit my website or give me a call! Please bear in mind I take on commercial work as well as private. Today I have hit 1000 followers on Twitter. 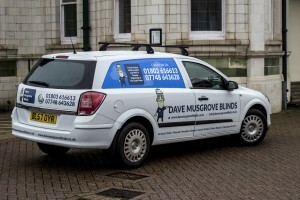 I would like to take this opportunity to thank everyone who has connected to me so far, who knew blinds would be so popular on social media! Look out for my temporary car! Here are my wheels for the next couple of days, while the work vehicle is in the garage. Amazing what you can fit in such a small Ka(car) with the back seats down. 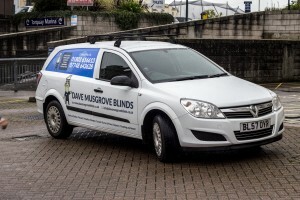 I have fitted 13 venetian blinds and a large roller blind today in Torquay and had all my tools and ladders in there as well. 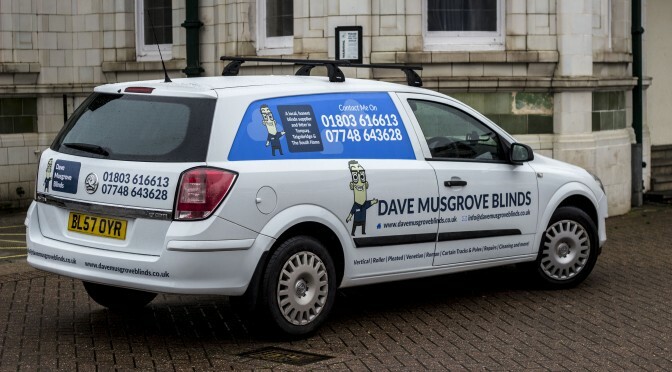 It takes more than a few car problems to stop Dave Musgrove Blinds getting the job done. 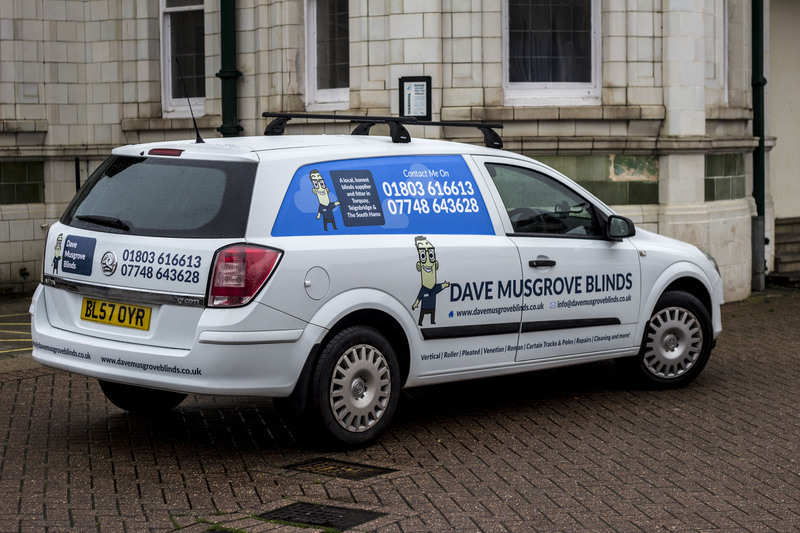 I thought I would take the time to explain to you how the business of Dave Musgrove Blinds came to be! After working for about 18 months for a blind company, in Paignton, that company was about to be closed down. 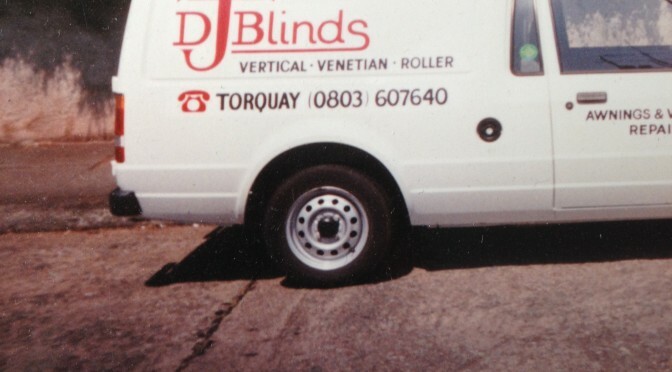 So I took the plunge and set out on my own as D J Blinds, as you can see from the attached photo of my first vehicle. That was back in June 1988. 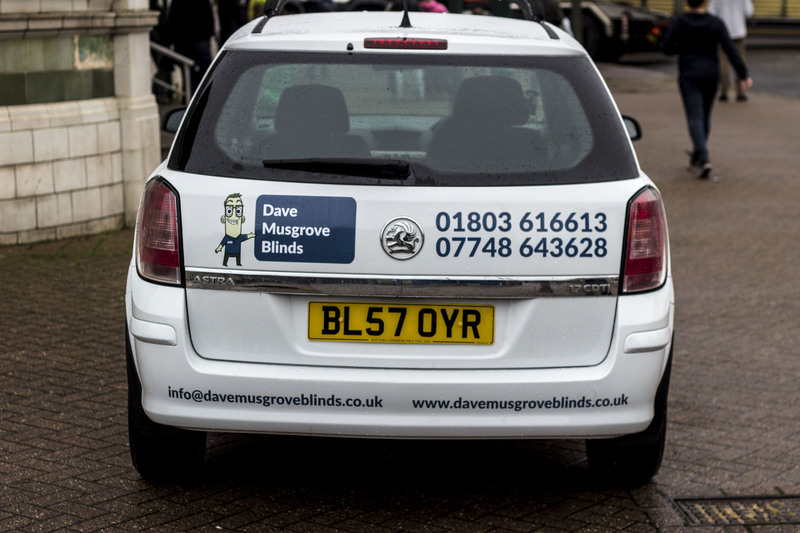 Now, here I am, 26 years later, with the only difference the recent re branding as Dave Musgrove Blinds, with new web site, logo, paperwork etc. I have never thought of expanding to take on staff, as I like the constant interaction with customers and the variety of doing all parts of the job to my own high standards. I recently spent a day fitting curtain tracks & vertical blinds, at Trinity School, in Teignmouth. I fitted Swish Deluxe plastic tracks to the new accommodation block as well as supplying all the heavy duty metal hooks and fitting the actual curtains, supplied by the school. I also fitted some lovely vertical blinds in navy blue. Child safety is always a concern for parents. Well, due to new laws, which came into force in April this year, you no longer have to worry about the safety of your blinds. All blinds now have to be fitted with an approved safety device to secure chains & cords out of the reach of small children. All of my blinds now come with these devices as standard. However, if you are concerned about your existing blinds, give me a call and I can arrange to come and fit one of these new devices to all your existing blinds. The cost will be small, particularly for the peace of mind it will bring to your you, your home and family. 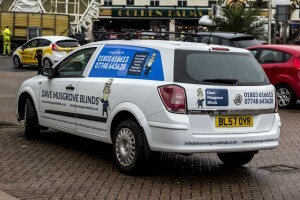 If you would like a quote or any advice regarding blinds, please feel free to give me a call or email.